Feargus the Demented is the first of the five bosses of the Lair of Draconis. Feargus can always have all 3 of his shades out. Feargus by default has all of the projectile attacks of the other 3 dragons. Feargus is surrounded by several Demented Eggs that will hatch into Obsidian Soul Shards when approached. Killing these is recommended, as they will take shots at players and heal the boss rapidly. Feargus himself will only begin combat if approached. Feargus awakens and immediately turns invisible while firing spreads of various shots in all directions. The “elemental” shots are not aimed, but his own “dark” shots are fired at the nearest player. He immediately summons his 3 Shades and begins slowly following the nearest player while spraying shots all around him. While he will chase players, he will eventually return to the middle of they go far away enough from the center of the room. He will also fire wide-area bombs at the nearest player. If any of his Shades are defeated, after a bit he will turn invisible and intangible while firing shots for several seconds before respawning all dead Shades. Every time he loses 1/4 of his HP, he will quickly return to the center of the room and fire rings of various shots while invisible and intangible. At about 1/8 HP, Feargus will return to the middle of the room and despawn, leaving a Chest behind. Any Shades that are still alive will self-terminate shortly. Everyone should fight this boss first, as it allow you to access the Ivory Wyvern’s lair after Pyrr, Limoz and Nikao have been defeated. Contrary to popular belief, there is no specific order in which you need to kill the aforementioned bosses as the only requirement is to kill Feargus first. If you decide to use a melee class for this fight, be wary of his spastic movements at times. After a few seconds of him chasing the players, he quickly goes back to the center of the room and goes invisible, and if anyone sits on the full shotgun, they are dead. This boss is arguably the easiest to long-ranged characters, as Feargus doesn’t always charge and tends to stay in the center most of the time. 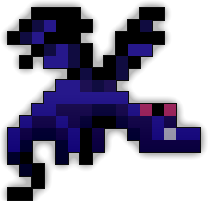 That in mind, while long ranged characters will laugh this dragon off, short range will have a slightly harder time. NOTE: This room is incredibly dangerous during lag spikes. If the Realm is headed towards Oryx, it is recommended to not participate, as the resulting lag can lead to an incredible amount of instantaneous deaths. Be warned.